Throughout my career in medical aesthetics, Pseudofolliculitis and ingrown hair has been a common concern. Often times it’s men who mistake the condition for acne, other times it’s someone who has had an infection and a doctor recommended they get laser hair removal. The bad news is, that it can be more serious than you might think. The good news is, it can be treated! Pseudofolliculitis commonly known as “razor bumps” or “ingrown hair” is an inflammatory condition in the skin and hair follicle caused by shaving, waxing and ingrown hairs. Pseudofolliculitis can occur anywhere on the body hair grows, however it most commonly occurs on a mans beard and for women on the bikini and underarm area. It tends to be more common in those with curly or coarse hair. There are two types of Pseudofolliculitis, extrafollicular and transfollicular. 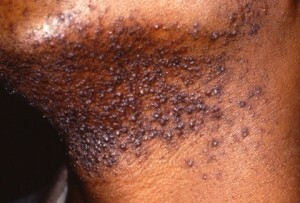 Extrafollicular pseudofolliculitis or “razor bumps” occur when curly hair grows back into a hair follicle. Transfollicular pseudofolliculitis or “ingrown hairs” occur when the hair never leaves the follicle, this can happen if the hair grows at an angle. The hair keratin causes inflammation in the skin, usually seen as pustules that look similar to acne. Concerns and complications associated with Pseudofolliculitis? Pseudofolliculitis can be painful, embarrassing but more concerning is that it can lead to scars, secondary infection or become abscessed. You may not think that an ingrown hair is a big deal, but it has been associated with serious secondary infections such as MRSA. When there is damage to the skin, it becomes more susceptible to bacteria such as Staphylococcus. It is not unusual for an ingrown hair to become infected with “staph” or become abscessed. In extreme cases, if left untreated staph can lead to a very serious blood infection known as sepsis. These infections can spread and be contagious. If you suspect an infection, you need to seek immediate medical attention. Laser hair removal remains the best treatment option for Pseudofolliculitis. A series of treatments will be needed, generally spaced 4-6 weeks apart. Another option is to quit shaving, waxing or tweezing and let the hair grow, but if that doesn’t work for you there are some things you can try. When shaving, start with cleansing the area with an exfoliating cleanser that has glycolic acid or some type of an AHA. I also recommend the Clarisonic cleansing brush, which will help to lift the hair. Before you shave place a steamed towel over the area, being careful not to burn your self. For sanitary reasons, I prefer a new razor. Avoid shaving too close, do not stretch the skin or shave against the direction of growth. If you have pustules, you may also be prescribed a topical antibiotic. Laser hair removal for skin of color, is challenging, but possible. If you have dark skin, be sure to find a laser technician that is also a skin specialist and has experience treating your skin type. Your specialist may recommend preconditioning the area prior to having laser treatment, it is important to comply with all instructions. We make these recommendations to prevent you from getting a burn. They may also suggest doing a test spot first to see how you respond to the laser treatment. Pigmented scars are the most common and can be treated consecutively with laser hair removal treatments. Pigmented scars can usually be treated with prescription strength skin care products, and chemical peels. Depressed scars require a deep treatment such as micro-needling, fractional laser resurfacing or dermabrasion. It is best to treat depressed or raised scars when the condition is well controlled. Keloid scars are very complicated and need to be diagnosed and treated by a dermatologist. I want to specify that keloid scars need to be diagnosed by a dermatologist, because raised scars are sometimes confused with keloid scars. This entry was posted on Monday, June 2nd, 2014 at 5:24 pm	and is filed under Acne, Hair Removal. You can follow any responses to this entry through the RSS 2.0 feed. You can leave a response, or trackback from your own site.